Facebook today followed the lead of Apple, Spotify, and YouTube in removing four Pages belonging to Infowar‘s Alex Jones, claiming those Pages repeatedly violated Community Standards against hateful and dehumanizing speech. Notably, this comes after Facebook‘s head honcho said the site would willingly host controversial content including Holocaust denial. 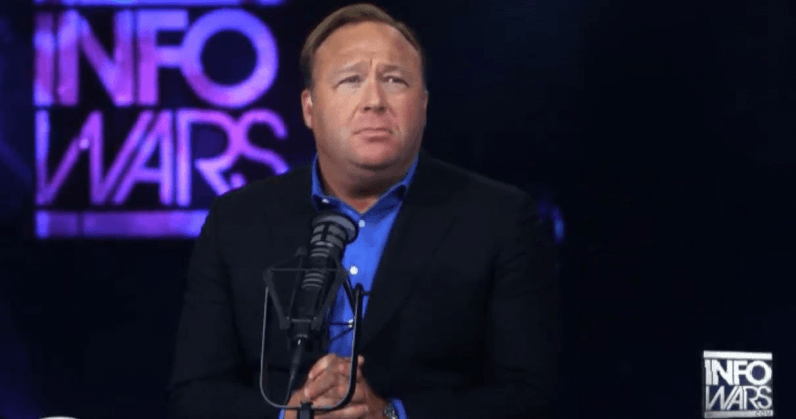 Within days of Jones’ lawyers desperately trying to convince everyone he doesn’t really mean what he espouses on his popular show, Jones has been summarily axed from several popular online platforms either over the weekend or today (Spotify had previously removed certain episodes of “The Alex Jones Show” last week and removed the whole show today). Each company cited Jones’ predilection for hate speech as the reason for its ban. The Facebook ban feels like an especially pointed sting considering CEO Mark Zuckerberg himself waffled over the topic of banning Jones less than a month ago. I agree that it is false. I also think that going to someone who is a victim of Sandy Hook and telling them, “Hey, no, you’re a liar” — that is harassment, and we actually will take that down. But overall, let’s take this [a] whole [lot] closer to home… I’m Jewish, and there’s a set of people who deny that the Holocaust happened.